Since 1975, American Tank Co., Inc. has been the nation’s largest supplier of polyethylene water tanks and plastic tanks of every conceivable shape, size and capacity. Over these past 35 years, we have supplied every type of plastic water tank and poly tank to customers all across the United States and Canada. We have helped tens of thousands of people to design, select and install their polyethylene storage tanks and poly tank accessories. From a plastic water tank for potable drinking water to a poly tank for chemical storage, no one knows more about plastic tanks than American Tank. Call toll free today: 1-877-655-1100 to speak to one of our friendly and knowledgeable Tank Specialists. 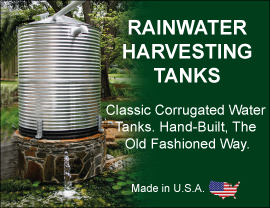 When it comes to plastic water tanks also known as polyethylene water tanks, no one beats our tremendous product selection, huge inventory and incredible everyday low prices! At American Tank you will find fast, friendly, knowledgeable service. Why not let one of our industrial plastic tank experts help you today? When it comes to poly tanks we know our business! We stock many of our most popular poly water tanks throughout California for fast, economical delivery. Be sure to ask about our incredible Super Saver shipping on many of our plastic water tanks.